Before we begin I want to announce I’m doing a little giveaway to celebrate this fantastic series! Sekai Project has been gracious enough to grant me an extra key and I want one of my good readers to have it! All you have to do is follow us on Twitter and retweet my original link for this review. We’ll be giving away the key March 1st! Now, onto the review! In my time as a critic here on VNs Now, few others titles have grabbed my attention like World End Economica has. What started as an import few understood has grown into the best thing in the Sekai Project catalog. Unfortunately, it was complete long before it reached our shores, otherwise we may have been able to convince Isuna Hasekura into continuing the series somehow. Either way, this elegant mix of a financial thriller with one of the better coming-of-age stories I’ve read in the medium was a pleasure to read from the beginning when it first landed here five years ago. Now, here we are at the conclusion. It has been eight years since we first met Hal, Hagana and the capitalist utopia centered Schrödinger Street. After the events of Episode 2 young Hal has become something of a celebrity. However, there is still some unfinished business he must attended to: he still hasn’t found Hagana. But that won’t be easy as the Lunar Surface has one more trial to throw at our heroes. And this time it could end it all. So, does Isuna Hasekura’s trilogy end with a bang or a whimper? There’s only one way to find out! As always, there are two stories being told here. The first is the arc that concludes Hal’s coming-of-age story and it’s here where I want to start. From the beginning, Yoshiharu Kawaru (or Hal, or Haru if you prefer) was always one of the more unlikely heroes in the visual novel sphere. He was never meant to be a self-insert character or someone the audience could project their fantasies onto. He’s an person who had ambitions and the intellect to see them through, but not necessarily the maturity people have come to expect from anime-styled male protagonists…often derided here as GMPs. Hal is incredibly human and therefore incredibly flawed. This gave him great possibilities that came with great responsibility. After all, if the narrative was going to ground him, it had to ground everyone around him as well. After eight years of tussling in the financial world and coming out on top, Hal has matured a great deal and become a fine man: learning from years of setback and turmoil. However, in many ways he is also more alone now than ever. The game starts off with him trying to patch the holes in the Lunar system: working with the central government to patch the holes in a pure capitalist system while leading the fund left to him by Eleanor Schweitzer after the events of Episode 2. However, outside of his new subordinate Marco, he’s become quite reclusive as the market marches on: defying him by profiting through strategies he deems illogical. That ‘defiance’ comes from a real estate investment scheme heavily influenced by the United States subprime mortgage crisis of 2007, followed by the recession of 2008. This is also where we begin to see the supporting cast declare their independence. We’ll come back to the crises in a moment, but it is Chris, who we’ve watched waver through the events of Episode 1 and 2, who finally comes into her own in Episode 3. I don’t know how fans of the series will see it, because traditionally the rejected girl in these situations never leaves the protagonist’s shadow. Current logic for anime and manga says they stick around, if for nothing more than just fan bait. Here though, Chris shows an incredible amount of ruthlessness as she puts her feelings for Hal and even her concern for other people aside and focuses on what she sees as important: her pursuit of power. It’s never framed as malevolent, but it is clearly necessary not just for her, but for Hal as well. I cannot say I would’ve made the same choices as Hal throughout the trilogy. However, the great thing about Hal’s story is that he is constantly learning: not only about the markets, but about himself. The Hal of Episode 3 is not the Hal of Episode 1 and in a genre that rewards repetition to the point of stagnation, it is always a pleasure to see a character age. More so, it is pleasant to see these characters mature in their own time. For example, Hal takes longer to fully embrace his adulthood than Chris or Eleanor, but takes shorter than Hagana who was the last lock he needed to open. Everyone has their own pace, but ultimately, they all do reach a level of maturity that allows them to work and support their society. It’s rare to see in ANY form of fiction these days, and to see it executed so well removes the trilogy from the realm of escapism that dominates entertainment these days. One supporting character that truly benefits from this development is the trilogy’s main antagonist Barton Kladwiesen. Kladwiesen was always a bit of a mystery in Economica: a master investor who always seemed in the middle of shady deals and had no scruples about manipulating whoever he needed to for his own ends. In any other story, he’d be the out-and-out villain and I certainly wouldn’t object. However, Hasekura takes a lot of care to frame him like a greedy, but ultimately loving father figure to Hal. He always puts his business priorities first, but even his cruelty is never so final that Hal can’t learn from it. It just takes Hal a while to understand how to grow from his conflicts with Kladwiesen. I really enjoyed how Kladwiesen’s character was used in Episode 3 and how that turned what could’ve been a terrible cliché into one of the few people in the game who absolutely understands the protagonist and is perfect at playing his foil. While the rest of the supporting cast are roller coasters in their own ways and even the new additions to the cast have moments of heartbreak and triumph, the series ends where it really began: with Hal, Hagana and Kladwiesen. Usually, the time with the supporting cast feels like a breather between the financial action and Hal’s story and it is finely woven into the plot. However, not every character gets time to add any more to their portrayal than has already been added. However, only one supporting character outright gets the shaft: John Eagle. Eagle is a young, pompadoured investor who is the new face of wealth on Schrödinger Street. However, once the problems begin to mount, he’s never heard from again. It’s ultimately an extended cameo that fit in with the feeling of life Economica wants to simulate: some people are with you for only a moment, others are connected through a lifetime. With the improved cast though comes new challenges. As Episode 2 was inspired by Enron and the energy crisis they helped inflate for profit, Episode 3 takes on the latest trend in the Lunar Stock Exchange: subprime mortgages. Developed by Chris, these mortgages are bundled and turned into an investment index for the elite investors of Schrödinger Street. This move shows that the markets, and the pure capitalist society that depends on it, ultimately learned nothing from Episode 2. Sure, one of the biggest critics of Avalon, Gazzanica, would become President of the Lunar Surface. However, the central government of this society is very weak and disabled by the various business interests of its members. In the four years between Episodes 2 and 3, it’s clear that the real power brokers of the Lunar Surface were more than happy to toss Avalon as a singular bad egg in their otherwise pure machinery and just move on. I mean, why actually pause to examine something that nearly crashed the Lunar economy when there is all this money to be made! This crisis separates itself from the other major issues in the previous two episodes by continuously escalating. Both the Trading Game of Episode 1 and the Energy Crisis of Episode 2 spanned their entire games with their peaks and valleys forming the bulk of the narrative. Here, the subprime mortgage crisis (much like the same crisis in our own world) starts very small: so small it seems trivial until the game reminds you exactly where you are. From there, the crisis grows deeper and darker as the free-market foundation of the city comes under direct attack and everyone is scrambling not to be consumed by the vultures just overhead. As usual, Hal is in the center, and as the crises build upon one another it really does begin to feel like the end of the world as they know it. Here is where Hasekura unleashes his most interesting discussion to date on the balance of capitalism and responsible government. The society of the Lunar Surface produces nothing. There are no raw materials it can harvest in exchange for the basics: such as food resources, building materials, machinery, etc. The only thing that keeps it going it’s that it is a purely capitalistic society. As long as the money keeps flowing, what they need to survive will continue to flow to them. Unfortunately, the inverse is true as well and if the money stops flowing, there’s no reason to stay on or build up the Moon any longer. I cannot speak for Hasekura’s personal politics; mostly because he manages to get through this trilogy squarely in the middle of the conversation. Usually, unrestrained capitalism is portrayed as a never-ending source of evil in fiction. In Economica, the free-market has a lot of issues and equality is not only a joke; it is roundly mocked. However, here the rampant greed of people like Barton Kladwiesen, John Eagle, Chris and sometimes Hal is leveled out with the more social-minded Gazzanica, Risa and sometimes Hal. The fact of the matter is that both sides need each other for a society to function and the Moon’s biggest issue is that it never acquired that sense of balance, which leaves it ripe for the series of events in this game. Episode 3 has several shades of the financial thriller that made me love Episode Two. But where it shows its maturity is when it becomes a political thriller: boldly digging into the role of central government in a capitalist, free-market economy and vice-versa. Not everyone will agree with the plans Hal and his allies come up with, and I think trying to get people to agree with them wasn’t the point in the first place. The overall point was to show that the plans, and eventual progress, Hal and others undertake is what is necessary to save something bigger than themselves and their own personal ambitions. The only definitive statement it ends on is closing Hal and Hagana’s character arcs. The rest is left open for the audience to reach their own conclusions on. That brings us to Hal and Hagana to close out this section. This is one area of the plot that I was not sold on coming into this title and a big reason for that is the emotional pay off between them is based on what happened in Episode 1. That is eight years out of contact, so if it was going to work Hasekura and Spicy Tails really had to bring it. To my surprise, for the most part they did. The game wisely keeps their reunion in its back pocket for the most part: weaving it into the larger plot. When they finally meet, and to try to keep this as spoiler-free as possible, it isn’t exactly what you think it should be. But by the end, the payoff between them is well-earned and it really feels like the past eight years in-game have built to the moment where both become very frank with one another. It isn’t seamless unfortunately. Because of everything going on with the plot, we get very little time with them to do anything more than resolve their storyline. For me at least, it felt like a pick-your-poison situation. They had to resolve it without it conflicting with anything else, but I felt more was needed from them to really sell this love that has spanned three games and eight years. I’m sure most will be satisfied, and I’d be lying if I said I wasn’t pulled in for most of their scenes together. It’s just an intangible that Hasekura seemed to connect with in his Spice and Wolf series that couldn’t quite reach here. I can also be pedantic though. The point is some will be completely swept away by what they see with these two while others may not, and I find both sides valid. It was handled decently for what it was, so let’s just leave it at that. As usual, the Presentation for Episode Three is fantastic. The basic character models show a great deal of detail and age fitting the overall time span in the trilogy. If I had to pick two favorites, it would probably be Barton and Eleanor. Barton because the game does not hold back and show him aging hard since the first time we met him eight years ago, and Eleanor because it shows how much healthier she is now than during the events of Episode 2. For reference, here is Eleanor’s character model in Episode 2 and this is Barton in Episode 1. Little touches like these are what makes following the art in a series like this so worthwhile. Similarly, the backgrounds and music are well done. The backgrounds especially show a level of detail that has been missing from the previous two installments. I believe this is due to more time being spent outdoors and more scenes happening at night: leading the artist to take advantage of different color tones and especially the consistently starry sky. I know this is a scientific impossibility, but it leads to some fantastic backdrops during the more dramatic scenes. The score has evolved as well: mixing high-tempo, big band Jazz with a sweeping orchestral-inspired score that is fantastic to listen to on its own as well as mixed in-game. I especially loved the tracks ‘Dear Old Friends’ and ‘Regret, Or…’ that plays when Hal reunites with his old friends, along with ‘The Club’ that so elegantly captures the elitism of Schrodinger Street and the combination of ‘Big Boss’ and ‘Termination’ that make up the soundtrack of the series’ grand finale. So, overall I have nothing but love for how this game is presented. It is a fantastic presentation. Now, to my strongest gripe in the entire game: Sekai Project. Sekai Project are the ones responsible handling the technical side of this game. So, how did they do? Poorly. The game is rife with grammatical and translation errors (they still insist on calling the Schweitzer family motto ‘Justice and Lord’, even though the banner in Episode 2 clearly bloody says ‘God and Justice’ for example), lines of dialogue aren’t attributed to the right speaker, extra menus that aren’t completely translated, an economic glossary for those who need it that only works half the time and I even ran into a few loading errors and glitches…in Japanese. Because of my hectic life last year, we never got an opportunity to discuss Sekai’s issues with completing the localization & properly issuing backer rewards on Kickstarter. Currently, Sekai Project is working on ensuring those rewards as well as finish a High Definition edition of the complete World End Economica Trilogy. However, the production issues that have plagued this project since it first launched five years ago, were never fully resolved. And as much as I want to let the issue go, Sekai Project wants to play with the big boys and bask in the limelight of bringing so many desired VNs to the West. Ergo, if they want the laurels, they’re going to have to take the blame too. The simple fact is that while Episode 3 isn’t broken by any means, the fact that we’re still dealing with technical issues here, at the end of the line, denotes either panic on Sekai Projects part or carelessness. Either way, we are well beyond the point of Sekai ensuring basic quality for all their products. Get it done. Not ‘get it together’, not ‘get to work on it’: Sekai Project, get it done. World End Economica Episode 3 comes in several different packages. You can either buy it on its own for $12.99 or in the World End Economica Complete bundle for $35. There’s also that HD remaster waiting in the wings, and I’m not sure if that will just update the current versions of each game or be its own thing. Either way, these are going to be your price points and this is probably the most detailed I will ever get on the replay value of a visual novel. So, here we go. It would be the absolute height of insanity to suggest that anyone could play Episode 3 without playing the first two. If you have, great: go ahead and buy Episode 3: it’s worth it. But then, you already know all the emotional weight of the story depends on you following the entire series from the beginning. So, if you don’t own Episodes 1 or 2, you must play them before playing Episode 3. Sorry, there is no skipping ahead in this story. In which, case, the best options for anyone who doesn’t own any episodes in the World End Economica Trilogy is the $35 bundle. That is $35 for over seventy hours of content. For me, this is more than fair. For people who have never played anything in this series before, I can understand being on the fence. But, I would at least suggest playing Episode 1 before writing off the entire series. I think most will be surprised how much they will enjoy the game and it’ll make the build-up to their eventual play through of Episode 3 even better. So, that’s the game plan here. If you’ve played Episodes 1 and 2, this is an automatic Must Buy. If you have never played World End Economica before, start at the beginning and work your way up. And yeah, all of that is worth $35. I can’t believe we’re at the end. 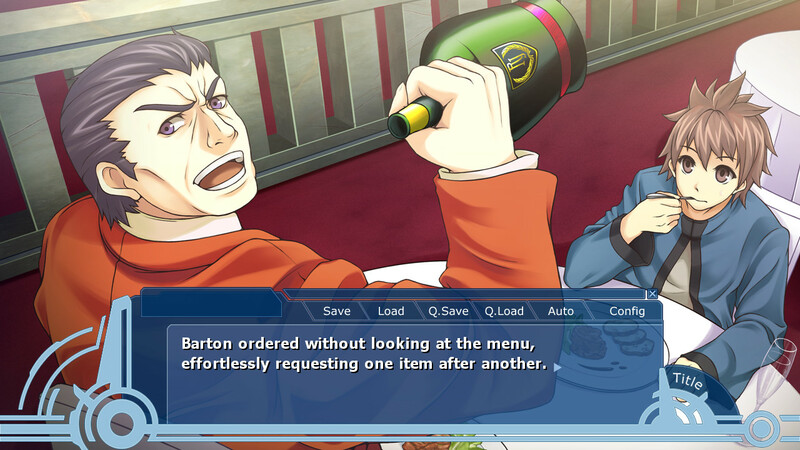 Visual Novels are a strange place for a trilogy to exist. Most titles either wrap everything up in a single entry or have multiple entries, spin-offs and spiritual successors to keep it going. A trilogy gives you three acts to form a complete story arc and build characters that we want to see get from beginning to end. It certainly isn’t impossible, but in just film alone trilogies that are rock solid in every entry are hard to find. And yet, here at the end, I can say with everything in me that this trilogy is Isuna Hasekura’s best work so far. Yes, better than Spice and Wolf. World End Economica juggles several story-lines and styles and accomplishes all of them with astounding success. It is a fantastic coming-of-age story with a protagonist you can help but root for by this point. It’s an intelligent political and financial thriller: combining commentary on the last three decades of international economics and affairs into a narrative roller-coaster with all the devastating lows and cheer-by-yourself highs that entails. It’s a solid love story that sees that I have been critical of, but ultimately loved its reunion and resolution. And even more than that, it’s one of the few visual novels where everyone in the audience can see themselves reflected in the cast. We’ve all been someone in the cast at some point in our lives and this game keeps that in mind as we see everyone mature, embrace their various roles in life and find their own happiness. This is easily the best game series in the Sekai Project catalog now and a title I am so glad we have in the West. If, for any reason, you’ve been on the fence for this one, ignore the detractors and start from the beginning and enjoy the story of a boy who wouldn’t stop trading, even at the end of the world. World End Economica.